As the saying goes, ‘less is more’. This couldn’t be truer in the sense of the Newlyweds wedding invitation from Paper Themes! Bold and elegant, this simple design is sure to be a hit amongst your guest list! Taking advantage of a beautiful silver foiled design, this wedding invitation shines and beautifully captures the light with its stunning proclamation ‘A brand new Mr and Mrs’. Printed on high quality white board in a romantic-style font and finished with a couple of silver foiled love hearts, the words ‘designer wedding invitation’ certainly spring to mind! The Newlyweds invitation has been designed as a handy pre-made wallet, meaning everything your guests needs to know about your wedding is all in one place. Upon opening the complementary envelope they’ll pull the outer sleeve down to reveal three separate inserts. These include your wedding invitation, guest information and RSVP, all featuring the same delightful love hearts and neatly tied together with a length of coordinating white satin ribbon. 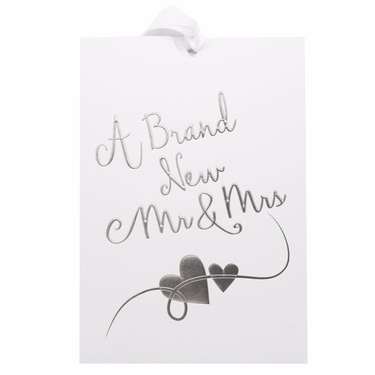 For those of you looking for a modern and sophisticated design without being overly feminine, Newlyweds is the perfect wedding stationary option. Its neutral colour palette lends itself to a range of wedding themes, from summer fetes right through to winter wonderlands! For a complete look throughout your wedding celebrations you can add a range of coordinating components such as Save the Date and Thank You cards as well as table numbers and place cards, making the organisation of your wedding stationary a breeze!